To receive a refund, deferral, or credit, you must register by June 30, 2018 for the Fort De Soto 15K & 5K Race and notify the race director by email (not Facebook) at least 3 weeks before the race or by September 9, 2018. This is when we order your personalized bib and start preparing your packet. There are no refunds due to cancellations due to an Act of God, such as weather. No deferral or transfer is available if you do not show up for the race. All refunds will be issued after the last race of the series (Shamrock Halfathon & 5K), on or about April 1, 2019. Yes. There are 4-5 packet pickups before the race. Click here for schedule. You can register for the race at all packet pickups, including race morning. Click here for schedule. Yes. The 5K and 15K courses are accurately measured and certified by the USATF. To view the course maps click here. Are the 15K and 5K loop courses? We require that runners and walkers be properly prepared and trained to finish the 15K within 3 hours (18 minute/mile pace). Please note that 3 hours after the start, course support ((i.e. aid/water stations, volunteers, course marshals, clocks, etc.) is not guaranteed. There are 7 aid stations with water and Gatordade starting at about mile 2.2. There is a combination of permanent facilities and portalets available along the courses. Yes, licensed sports massage therapists will have a tent set up and will provide massages in 10 minute increments for $12/10 minutes. Results will be posted at this link a few hours after the race. For timing and scoring questions please send us an email at info@FLRoadraces.com. Our chief scorer will get back to you within 24 hours. The awards ceremony starts around 8:45 a.m for the 5K and soon thereafter for the 15K. It is located at the races’ post-race party area. All 15K finishers receive our unique gold running starfish medal. All 5K finishers receive our unique gold running starfish medal. 3) We encourage small non-profits to use our Clearwater 5K Walkathon as a fundraiser. In a nutshell, any non-profit that registers with us and recruits athletes to participate in the walk, receives $20 of the $30 entry fee. We have all the infrastructure, permits, etc. in place. All a non-profit needs to do is recruit its supporters. 4) We often provide comp entries as raffle items for auctions at churches, schools, fundraisers, etc., and we donate modest amounts of cash when our athletes are raising funds for their pet projects. 5) Through our races, we provide exposure to other fundraising events via Facebook post, emails, and our goody bags. 6) Our biggest area of charitable endeavor is to provide our race management services, equipment and time, pro bono or partial pro-bono, to non-profits that stage races. In prior years, we did this for the Partners For Life Police Appreciation Run. Recently, we helped the Celma Mastry Ovarian Cancer Foundation increase participation by 50% for its One Step Closer to the Cure 5K / 10K / 1 Miler. 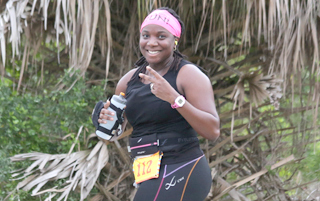 On September 27, we are helping a fellow race director stage her Sunrise Run. We also offer our time or equipment when applicable, such as volunteering at Gasparilla and the St. Pete Road Runners 5K Beach Series. 7) The absolute most satisfying charitable endeavor last season was to create and stage the “Tampa Bay for Boston Memorial Run.” Just about 3 weeks after the Boston Marathon bombing, we hosted 800 athletes in St. Pete for a candlelight vigil and memorial run, raising $15,000 for the victims through The One Fund Boston.